Scripted documentary and interview with artist-sculptor-filmmaker-surrealist Hans Richter centres on his place in history and his pioneering work in several areas. Richter talks about his career, early experiments with the movie camera, association with the world of the Surrealists, conflict with the National Socialists in Germany, the origins of Dada, and the evolution of his own style in painting, drawing, and collage. Many films clips and examples of his graphic work illustrate his themes: opposition of the Nazis, who saw that chaos in art was inimical to their own idea of a new world order; how Dada has affected Pop Art and the new realism in literature, music, painting, art and theatre; the Bauhaus group and other contemporary artists from many fields - Jean Arp, Tristan Tzara, Marcel Duchamp, Darius Milhaud, Leger, Sergei Eisenstein, Man Ray. Contains clips from: Ghosts Before Breakfast (bowler hats flying in early trick photography), 1927 Inflation (a collage-film response to the devastating German inflation of 1921), 1926-29 Rhythmus 21, 1928 Dreams That Money Can Buy, 1944-47 Dadascope, 1955-61 8 by 8 A Chess Sonata in 8 Movements, 1955-57 All rights of the producer and of the owner of the work are reserved. Unless authorized by the rights holder, no duplication, hiring, lending or public screenings are allowed. For institutional purchase please contact Re:Voir directly. 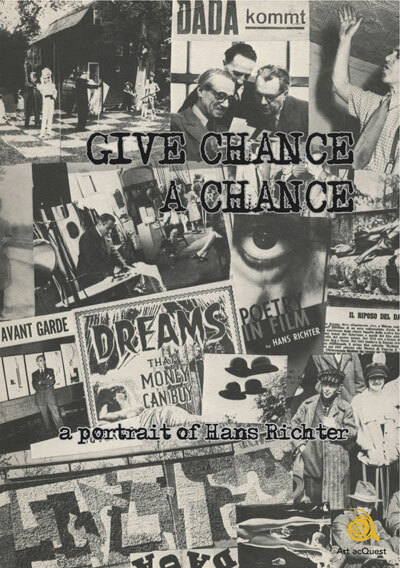 Scripted documentary and interview with artist-sculptor-filmmaker-surrealist Hans Richter centres on his place in history and his pioneering work in several areas. Richter talks about his career, early experiments with the movie camera, association with the world of the Surrealists, conflict with the National Socialists in Germany, the origins of Dada, and the evolution of his own style in painting, drawing, and collage. Many films clips and examples of his graphic work illustrate his themes: opposition of the Nazis, who saw that chaos in art was inimical to their own idea of a new world order; how Dada has affected Pop Art and the new realism in literature, music, painting, art and theatre; the Bauhaus group and other contemporary artists from many fields - Jean Arp, Tristan Tzara, Marcel Duchamp, Darius Milhaud, Leger, Sergei Eisenstein, Man Ray. Contains clips from: Ghosts Before Breakfast (bowler hats flying in early trick photography), 1927 Inflation (a collage-film response to the devastating German inflation of 1921), 1926-29 Rhythmus 21, 1928 Dreams That Money Can Buy, 1944-47 Dadascope, 1955-61 8 by 8 A Chess Sonata in 8 Movements, 1955-57 All rights of the producer and of the owner of the work are reserved. Unless authorized by the rights holder, no duplication, hiring, lending or public screenings are allowed. For institutional purchase please contact Re:Voir directly.